Free, Exclusive Club Volunteer T-Shirt And Cap! Save the Manatee Club’s dedicated volunteers make a wonderful difference in the lives of manatees. Thank you! The Club’s Volunteer Rewards Program offers our current Club members/volunteers a chance to “earn points” towards special volunteer merchandise. 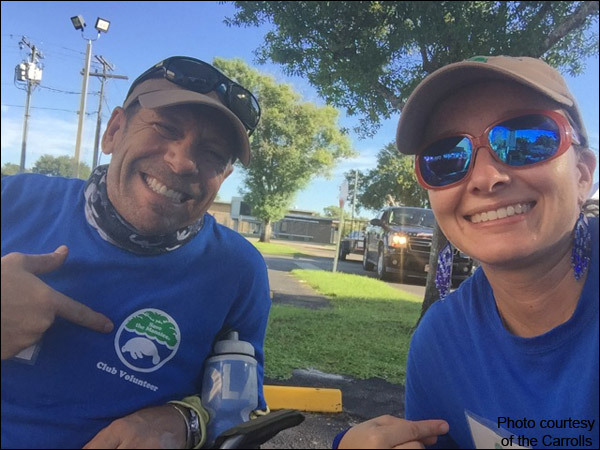 Earn special volunteer t-shirts and caps, like Tim and Tamara Carroll are wearing in the photo, by donating volunteer hours at events, presentations, or at the Club. Volunteers must be current Save the Manatee Club members (adopted a manatee in the past year) in order to earn points towards exclusive SMC volunteer merchandise. These items are not available for purchase by volunteers or the general public. Points are earned by staffing tables at SMC events and festivals, by giving SMC manatee presentations at schools, organizations, etc., and by helping out in-office at SMC’s Maitland location. Each hour volunteered is worth one point. Those who set up at events and presentations earn an extra point, and those who help with break down at events and presentations earn an extra point. The Club keeps a database of hours earned. The Volunteer Rewards Program items for 2019 are a specially designed “Club Volunteer” blue T-shirt and a khaki cap. See photos above and below. Eight points are needed in 2019 to obtain the free Club Volunteer T-shirt and cap. These come as a set. Points earned this year are retroactive as of Jan. 1, 2019. Those volunteers who wish to participate in the program but are not yet members, or their membership has expired, can join the Club and collect points earned at volunteer events and presentations as of Jan. 1, 2019. Points are not carried from one calendar year to the next. Each volunteer starts at zero on the 1st of each year. Same items cannot be earned twice. Club award items may be carried over from one year to the next, depending on supply, and decided on by the Club. Awards points are non-transferable from one volunteer to another. The Club reserves the right to discontinue the program at any time without notice. 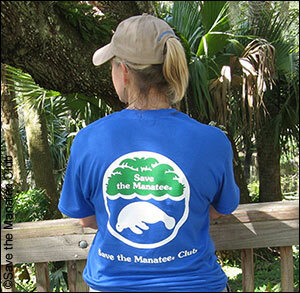 The T-shirt also features the Save the Manatee Club logo and web site on the back. For more information on the Volunteer Rewards Program, contact Diana Ngai, Communications and Outreach Manager, at dngai@savethemanatee.org. Start Earning Your Club Volunteer Points! Get a description of volunteer positions and fill out our online volunteer application form.